The 17th Annual Benefit Concert with The Gilfords and Garden State Radio, held on November 17, 2018 at Irving Plaza in New York, raised over $60,000. As a result of these funding efforts, the foundation has made a major donation to Memorial Sloan Kettering’s Pediatric Cancer Center for child & teen patients. Memorial Sloan Kettering takes a team approach to caring for children, adolescents, and young adults with cancer. Their experts - from physicians and nurses to child life specialists and teachers - share the goal of curing your child and returning him or her to a life focused on family, friends, and the future. Proceeds from this event have been also been donated to Anchor Program Fund, Babies Heart Fund, Books for Kids, Chad Tough Foundation, The Child Care Council of Suffolk County, Children's Medical Fund, Dysautonomia Medical Research, East Harlem Tutorial Program, Gillen Brewer School, Go With Courage, Hands in 4 Youth, Jack Martin Foundation, Lev Torah Yeshiva Scholarship, Marc Zeplin Scholarship Fund, Michael’s Cause, My Face, 9/11 Memorial Tribute Center, National CMV Foundation, Organization for Autism Research, Pediatric Cancer Foundation, Scope, Sensory Beans, Smart Kids, Stride, Tuesday's Children, Urban Dove. The Marc Zeplin Scholarships for 2018 were awarded at Honors Night at Oceanside High School to Megan Morillo Tores and Thomas John Palotta. These students received financial contributions, funded directly to their chosen university. Megan will be attending Farmingdale State College and Thomas will be attending SUNY New Paltz. 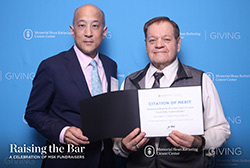 For the sixth straight year, The Marc S. Zeplin Foundation was honored at Memorial Sloan Kettering Cancer Center's Donor Recognition Reception on May 3, 2018. Accepting the award on behalf of the foundation were board members: Joslin Paradise, Leona Zeplin and Leonard Zeplin. The 16th Annual Benefit Concert with The Gilfords and Stifler's Mom, held on November 18, 2017 at Irving Plaza in New York, raised over $50,000. As a result of these funding efforts, the foundation has made a major donation to Pediatric Cancer Care at Memorial Sloan Kettering Cancer Center. Memorial Sloan Kettering takes a team approach to caring for children, adolescents, and young adults with cancer. Their experts - from physicians and nurses to child life specialists and teachers - share the goal of curing your child and returning him or her to a life focused on family, friends, and the future. Proceeds from this event have been also been donated to Anchor Program Fund, Babies Heart Fund, Books for Kids, The Child Care Council of Suffolk County, Children's Medical Fund, Dysautonomia Medical Research, East Harlem Tutorial Program, Gillen Brewer School, Go With Courage, Hands in 4 Youth, Jack Martin Foundation, Justin Gimelstob Children's Fund, Lev Torah Yeshiva Scholarship, Marc Zeplin Scholarship Fund, My Face, 9/11 Memorial Tribute Center, Sensory Beans, Stride, Pediatric Cancer Foundation, Tuesday's Children, Urban Dove. The Marc Zeplin Scholarships for 2017 were awarded at Honors Night at Oceanside High School to Julieta Eulau and George T. Whitbread III. These students received financial contributions, funded directly to their chosen university. Julieta will be attending SUNY Oneonta and George will be attending St. John's University. 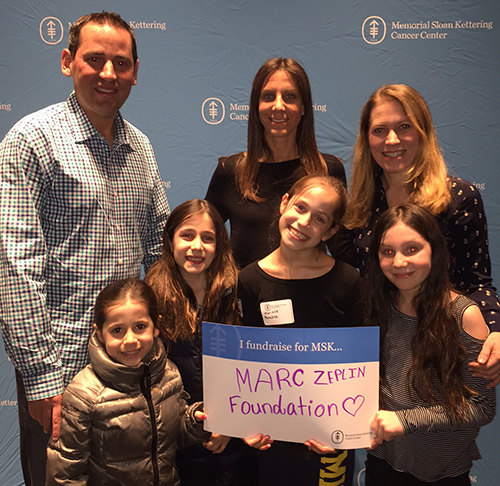 For the fifth straight year, The Marc S. Zeplin Foundation was honored at Memorial Sloan Kettering Cancer Center's Donor Recognition Reception on May 9, 2017. Accepting the award on behalf of the foundation were board members: Mitchell Hassenbein and Joslin Paradise. The 15th Annual Benefit Concert with The Gilfords and Weird Science, held on November 19, 2016 at Irving Plaza in New York, raised over $50,000. As a result of these funding efforts, the foundation has made a major donation to Pediatric Cancer Care at Memorial Sloan Kettering Cancer Center. Memorial Sloan Kettering takes a team approach to caring for children, adolescents, and young adults with cancer. Their experts - from physicians and nurses to child life specialists and teachers - share the goal of curing your child and returning him or her to a life focused on family, friends, and the future. Proceeds from this event have been also been donated to Hands in 4Youth, East Harlem Tutorial Program, The Child Care Council of Suffolk County, Books for Kids, Justin Gimelstob Children's Fund, Sensory Beans, Go With Courage, Pediatric Cancer Foundation, Dystonia Medical Research, Tuesday's Children, 9/11 Memorial Tribute Center, Gillen Brewer School, Shooting Stars Program, Liv Torah and The Marc Zeplin Scholarship Fund. The Marc Zeplin Scholarships for 2016 were awarded at Honors Night at Oceanside High School to Elbania Flete and Joseph Cohen. These students received financial contributions, funded directly to their chosen university. Elbania will be attending Baruch College and Joseph will be attending SUNY Oneonta. 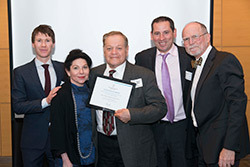 For the fourth straight year, The Marc S. Zeplin Foundation was honored at Memorial Sloan Kettering Cancer Center’s Donor Recognition Reception on May 3, 2016. Accepting the award on behalf of the foundation were board members: Mitchell Hassenbein, Leona Zeplin and Leonard Zeplin. The 14th Annual Benefit Concert with The Gilfords and Elektrik Company, held on November 21, 2015 at Irving Plaza in New York, raised over $50,000. As a result of these funding efforts, the foundation has made a major donation to Pediatric Cancer Care at Memorial Sloan Kettering Cancer Center, directly supporting The Joy Fund, Pediatric Care Fund and Pediatric Sarcoma Research. Memorial Sloan Kettering takes a team approach to caring for children, adolescents, and young adults with cancer. Their experts - from physicians and nurses to child life specialists and teachers - share the goal of curing your child and returning him or her to a life focused on family, friends, and the future. Proceeds from this event have been also been donated to Vacamas Programs for Youth, East Harlem Tutorial Program, The Child Care Council of Suffolk County, Books for Kids, Justin Gimelstob Children's Fund, Sensory Beans, Stride, Go With Courage, Babies Heart Fund, SCOPE, Pediatric Cancer Foundation, Dystonia Medical Research, Tuesday's Children, 9/11 Memorial Tribute Center, Liv Torah, Children's Medical Fund, Jewish Heritage Center and The Marc Zeplin Scholarship Fund. The Marc Zeplin Scholarships for 2015 were awarded at Honors Night at Oceanside High School to Henesis Vega and Alyssa Hernandez. These students received financial contributions, funded directly to their chosen university. Both students will be attending Nassau Community College. The 13th Annual Benefit Concert with The Gilfords and Stifler's Mom, held on November 22, 2014 at Irving Plaza in New York, raised over $50,000. As a result of these funding efforts, the foundation has made a major donation to Pediatric Cancer Care at Memorial Sloan Kettering Cancer Center, directly supporting The Joy Fund, Pediatric Care Fund and Pediatric Sarcoma Research. Memorial Sloan Kettering takes a team approach to caring for children, adolescents, and young adults with cancer. Their experts - from physicians and nurses to child life specialists and teachers - share the goal of curing your child and returning him or her to a life focused on family, friends, and the future. Proceeds from this event have been also been donated to Vacamas Programs for Youth, Hayden's Hope, East Harlem Tutorial Program, Gillen Brewer School, The Child Care Council of Suffolk County, Books for Kids, Justin Gimelstob Children's Fund, Riley Sandler Memorial Fund, Go With Courage, Jacob's Cure, Babies Heart Fund, SCOPE, Pediatric Cancer Foundation, Dystonia Medical Research, Tuesday's Children, 9/11 Memorial Tribute Center, Liv Torah, Children's Medical Fund, Jewish Heritage Center and The Marc Zeplin Scholarship Fund. The Marc Zeplin Scholarships for 2014 were awarded at Honors Night at Oceanside High School to Renee Russo and Laura Marielvis C. Marte Lopez. These students received financial contributions, funded directly to their chosen university. Renee will be attending Adelphi University and Marielvis will be attending Queens College. 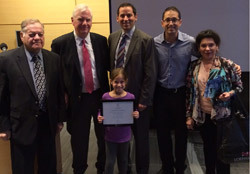 The Marc S. Zeplin Foundation was honored to receive a plaque in recognition for our support of Memorial Sloan-Kettering's Pediatric Care Unit at the Donor Recognition Reception on May 8, 2014. The 12th Annual Benefit Concert with The Gilfords and The Cold Spring Harbor Band, held on November 23, 2013 at Le Poisson Rouge in New York, raised close to $40,000. As a result of these funding efforts, the foundation has made a major donation made to the Pediatric Cancer Care at Memorial Sloan-Kettering Cancer Center, directly supporting The Joy Fund, Pediatric Care Fund and Pediatric Sarcoma Research. Memorial Sloan Kettering takes a team approach to caring for children, adolescents, and young adults with cancer. Their experts - from physicians and nurses to child life specialists and teachers - share the goal of curing your child and returning him or her to a life focused on family, friends, and the future. Proceeds from this event have been also been donated to Tuesday's Children, SCOPE, Pediatric Cancer Foundation, Dystonia Medical Research, Babies Heart Fund, Vacamas Programs for Youth, Imagination Library, Justin Gimelstob Children's Fund, The Child Care Council of Suffolk County, Gillen Brewer School, East Harlem Tutorial Program, The Yeshiva of Flatbush and The Marc Zeplin Scholarship Fund. The Marc Zeplin Scholarships for 2013 were awarded at Honors Night at Oceanside High School to KatherinLynn Lenowitz and Laura Raimondo. These students received financial contributions, funded directly to their chosen university. KatherinLynn will be attending Hudson Valley Community College and Laura will be attending Nassau Community College. 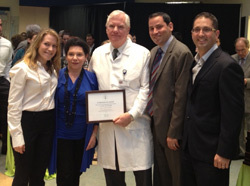 The Marc S. Zeplin Foundation was honored to receive a plaque in recognition for our support of Memorial Sloan-Kettering's Pediatric Care Unit at the Donor Recognition Reception on May 8, 2013. The 11th Annual Benefit Concert with Tramps Like Us and The Gilfords, held on November 17, 2012 at Le Poisson Rouge in New York, raised close to $40,000. The foundation has made a major donation made to The Joy Fund of the Pediatric Unit at Memorial Sloan-Kettering Cancer Center. The Joy Fund helps make the pediatric patients experience at MSKCC less trying by hosting parties and special events and providing entertainment and educational resources. Proceeds from this event have been also been donated to Pediatric Cancer Foundation, SCOPE, Tuesday's Children, Dystonia Medical Research, East Harlem Tutorial Program, Books for Kids, Justin Gimelstob Children's Fund, The Child Care Council of Suffolk County, Save the Children's Hurricane Sandy Emergency Fund, The Yeshiva of Flatbush Hurricane Sandy Fund, Vacamas Programs for Youth and The Children of Newtown, CT.
Marc's youngest son, Ethan Zeplin, was among the family members who were readers at the Ground Zero ceremony, commemorating the 11th anniversary of the attacks on September 11th. Ethan did an amazing job and paid special tribute to his dad at the end of his reading. The Marc Zeplin Scholarships for 2012 were awarded at Honors Night at Oceanside High School to Chelsea Borsack and Katterin White. These students received financial contributions, funded directly to their chosen university. Chelsea will be attending Wagner College and Katterin will be attending Carnegie Mellon University. The 10th Annual Benefit Concert with Tramps Like Us, held on November 19, 2011 at Hiro Ballroom in New York, raised close to $50,000. Proceeds from this event have been donated to Julien Collot Foundation, The Children's Organ Transplant Association, Vacamas, Justin Gimelstob Children's Fund, Pediatric, Cancer Foundation, Babies Heart Fund, John Thiessen Children's Foundation, The Child Care Council of Suffolk County, Steven Kurtz Foundation, Joseph Beyda Foundation, American Friends of Hebrew University, Holiday Magic, Voices of 9/11, Scott Weingard Memorial Fund, SCOPE, and Muscular Dystrophy Association. Marc's oldest son, Ryan Zeplin, was among the children who were readers at the Ground Zero ceremony, commemorating the 10th anniversary of the attacks on September 11th. Ryan shared a moving tribute to his dad following his reading. The Marc Zeplin Scholarships for 2011 were awarded at Honors Night at Oceanside High School to Carolina Jordan and Alisa Mascarehnas. These students received financial contributions, funded directly to their chosen university. Carolina will be attending American University and Alisa will be attending SUNY Buffalo. The 9th Annual Benefit Concert with Tramps Like Us, held on November 20, 2010 at Crash Mansion in New York, raised over $25,000. Proceeds from this event have been donated to The Ronald McDonald House, People Against Childhood Epilepsy, John Thiessen Children's Foundation, Child Care Council of Suffolk County, Pediatric Cancer Foundation, Jacob's Cure, Babies Heart Fund, Justin Gimelstob Children's Fund, SLE Lupus Foundation, Vacamas and The Sarah Jane Brain Project. The foundation held a benefit concert in Westchester on June 19th with all proceeds to be donated to Autism Speaks, an organization that has grown into the nation's largest autism science and advocacy organization, dedicated to funding research into the causes, prevention, treatments and a cure for autism; increasing awareness of autism spectrum disorders; and advocating for the needs of individuals with autism and their families. The Marc Zeplin Scholarships for 2010 were awarded at Honors Night at Oceanside High School to Joseph Checco and Hayley Riesel. These students received financial contributions, funded directly to their chosen university. Joseph will be attending SUNY Oneonta and Hayley will be attending SUNY Buffalo. The Foundation has recently made a financial contribution to Save the Children, an organization we have partnered with in the past. Save the Children is focused on distributing food and life-saving supplies to over 200,000 children and families effected by the Haiti Earthquake Disaster. The 8th Annual Benefit Concert with Tramps Like Us, held on November 14, 2009 at Crash Mansion in New York, raised close to $20,000. Proceeds from this event have been donated to People Against Childhood Epilepsy, Ronald McDonald House, The Give Back Foundation, Child Care Council of Suffolk County, Babies Heart Fund and Pediatric Cancer Foundation. The Marc S. Zeplin Foundation was proud to support the Miles of Smiles Foundation in memory of Michael Lewis Wolkis. Miles of Smiles accepts donations for the purpose of awarding scholarships, furthering neurological research, and giving sports equipment to less fortunate children. The Marc Zeplin Scholarships for 2009 were awarded at Honors Night at Oceanside High School to Maxine Swick and Markquse Chess. These students received financial contributions, funded directly to their chosen university. Maxine will be attending SUNY Albany and Markquse will be attending Johnson & Wales. September 11, 2008 marked the 7th anniversary of the attacks on the World Trade Center. Debra, along with her kids, Ryan and Ethan Zeplin, honored the memory of Marc by visiting the memorial tree in Oceanside, NY and the special memorial in Valhalla, NY. The Marc S. Zeplin Foundation has made recent donations to Chai Life, Camp Brooklyn, Pediatric Cancer Bikeathon, A Little Hope and the Chinese Consulate in support of Earthquake Relief for Children. The Marc Zeplin Scholarships for 2008 were awarded at Honors Night at Oceanside High School to Vincent DiRocco and Christina Trevino-Gutierrez. These students received financial contributions, funded directly to their chosen university. Vincent will be attending Nassau Community College and Christina will be attending Molloy College. 2007 was a special year for the Marc. S. Zeplin Foundation and the Pediatric Cancer Foundation, as we were proud to sponsor two fantastic events in support of this wonderful organization. Our 2nd Family Fun Day on September 16th and our 6th Annual Benefit Concert raised over $50,000 for PCF. PCF's mission is to fund research for state-of-the-art equipment and parent/patient care at leading world renowned hospitals in order to help the 12,000 infants and children diagnosed with cancer each year. Lenny Zeplin, Treasuer of the Marc S. Zeplin Foundation, participated in a forum on terrorism sponsored by the I. Chera and Sons Foundation at the home of Ricky and Monique Chera of Brooklyn, NY. Sherry Mandel, who lost her son from a terrorist attack in Israel and Lenny Zeplin, who lost his son in the terrorist attack in 9/11, were the keynote speakers during the evening meeting on May 6, 2007. The I. Chera and Sons Foundation raised $18,000 in contributions for the Marc S. Zeplin Foundation. The donations will be used to fund the Marc Zeplin Scholarship Fund and will form the foundation of future givings to non-profit organizations that help children in need with health/medical, mental health and educational support. The Foundation was represented at the Lighthouse International 5th Annual Golf & Tennis Classic and Dinner at Old Oaks Country Club in Purchase, NY. It is the mission of Lighthouse International to help people over come the challenges of vision loss. The Marc S. Zeplin Foundation has made funding contributions to the Lighthouse Children's School and the Lighthouse Music School for Children. The Town of Hempstead dedicated a monument to the 9 Oceanside residents who lost their lives on September 11, 2001, Marc is included on this monument. Supervisor Kate Murray and Senior Councilman Anthony J. Santino presided over the dedication, which included moving remarks from Margie Miller, Father Patrick Sullivan and Rabbi Philmore Berger. Special thanks to Roger & Adele Folz of the Elliot Howard Folz Foundation for donating this monument. Later that day, family members visited the Marc Zeplin Memorial Tree in Oceanside Park. The Marc Zeplin Scholarships for 2007 were awarded at Honors Night at Oceanside High School to Robert Pav and Frank Viola. These students received financial contributions, funded directly to their chosen university. Robert will be attending SUNY Farmingdale and Frank will be attending SUNY Albany. Marc's wife, Debra Zeplin was among the many spouses, partners and significant others who were readers at the Ground Zero ceremony, commemorating the 5th anniversary of the attacks on the World Trade Center. Westchester County dedicated The Rising, an 80-foot-high stainless steel sculpture at the Kensico Dam Plaza in Valhalla. At the base of the structure are granite stones that bear the names of those Westchester residents who died in the events of Sept. 11, 2001 and an inscription about them provided by their families. Marc Zeplin was among the Westchester residents memorialized. The dedication featured speeches by Senators Hillary Clinton and Charles Schumer. The Marc Zeplin Scholarships for 2006 were awarded in Oceanside High School to Megan Flaherty and Brian O'Malley. These students received financial contributions, funded directly to their chosen university. Megan will be attending Marist College and Brian will be attending Siena College. Proceeds from the 4th Annual Marc S. Zeplin 3 on 3 Basketball Challenge, held Saturday March 18, 2006 went to support Jacob's Cure and the Dysautonomia Foundation. Jacob's Cure is a non-profit foundation fighting for a cure for Canavan disease, a devastating genetic brain disorder that afflicts children. Jacob's Cure supports the continuation and advancement of research in gene-therapy, as well as the support of neural stem cell transplantation that has exhibited great hope in curing Canavan and most brain disorders. The Dysautonomia Foundation, Inc. is a non-profit organization founded in 1951, that supports clinical care and scientific research in the fight against Familial Dysautonomia, a genetic disease present at birth in male and female Jewish babies. The disease causes dysfunction of the autonomic and sensory nervous systems. The Marc S. Zeplin Foundation has a made a financial contribution to the Pediatric Cancer Foundation in support of their Bikeathon on May 21, 2006 in White Plains, NY. The Pediatric Cancer Foundation supports patient care, funds research, and provides seed money to finance new protocols and therapies in the fight against childhood cancer. Marc's sister, Joslin Zeplin was among the many siblings who were readers at the Ground Zero ceremony, commemorating the 4th anniversary of the Attacks on the World Trade Center. The Marc S. Zeplin Foundation supports the Child Care Council of Suffolk Inc. The Adolescent Reproductive Health (ARSH) programs in Bolivia, which focus on adolescents with limited access to reproductive health information and services, and involve them, their families and communities in activities that provide these vital resources. The Child-centered Alternatives for non-formal Community Education (CHANCE) in Uganda. This community based initiative provides high quality, supportive education to vulnerable girls and boys who cannot attend traditional school. The Marc Zeplin Scholarship for 2005 was awarded to the following deserving students: From Big Brothers, Big Sisters: Jennifer Hernandez and Karina Hernandez. From Oceanside High School: Brian O'Malley and Megan Flaherty. These students received financial contributions, funded directly to their chosen university. Proceeds from the 3rd Annual Marc S. Zeplin 3 on 3 Basketball Challenge, held Saturday March 26, 2005 went to support Green Chimney's and Westchester Children's Hospital. Green Chimneys is the nationally renowned, non-profit agency recognized as the leader in restoring possibilities for emotionally injured and at-risk children. Recognized as the worldwide leader in animal-assisted therapy, Green Chimneys operates residential treatment for children and a special education school. Its mission is to help children reclaim their youth and the chance for a bright future through specialized treatment and educational and recreational services. Westchester Children's Hospital is a world-class hospital offering advanced, life-saving care to the one million children in our region. Each year, 20,000 critically ill infants and children receive life-saving care from the dedicated team of doctors, nurses and professional staff at our facility. These children are treated with open-heart surgery, organ transplantation, advanced chemotherapy, emergency trauma surgery and other medical and surgical programs that are not available anywhere else in the Hudson Valley region or in lower Connecticut. The Marc S. Zeplin Foundation recently made a financial contribution to Save the Children, an organization founded in the United States in 1932 as a nonprofit child-assistance organization to make lasting positive change in the lives of children in need. Save the Children has been extremely active in providing assistance to children in Asia affected by the devastation of the tsunami. September 11, 2004 Leonard and Leona Zeplin were among the parents and grandparents who were readers at the Ground Zero ceremony, commemorating the 3rd anniversary of the Attacks on the World Trade Center. Among the names read were that of their son Marc. The Marc S. Zeplin Foundation supports the Scott Hazelcorn Children's Foundation. At the 2nd Annual Marc S. Zeplin Foundation 3 on 3 Basketball Challenge, the foundation made a financial contribution to the Scott Hazelcorn Children's Foundation. This foundation was established to honor the memory of Scott Hazelcorn, who lost his life on September 11, 2001 and is dedicated to providing support to the children of September 11th. They do this through 'Camp Haze,' a one week all expense paid summer camp very specifically created for children who've lost a loved one due to the World Trade Center attack. Please visit www.camphaze.org for more information on this wonderful foundation. 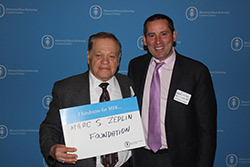 The Marc S. Zeplin Foundation supports the "Gift of Life" program. In March 2004, the Marc S. Zeplin Foundation made a financial contribution to the "Gift of Life" program. This program is designed to assist children in need of bone marrow transplants. Our contribution will help towards facilitating bone marrow transplants for patients around the world suffering from life-threatening illnesses by increasing the representation of people in the bone marrow donor pool. 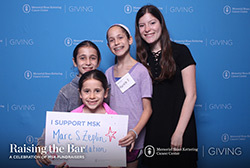 The Marc S. Zeplin Foundation supports Aishel Shabbat. This past winter, the Marc S. Zeplin Foundation has made a financial contribution to Aishel Shabbat, an organization established to provide food for families in need. The families that benefit are those have "slipped through the cracks," as they are not considered poor enough by the system to collect welfare nor do they have enough money to finish their week. Our contribution went directly to feed the families and provide them with needed support. Rob Grapin runs the Weston Rotary Half Marathon in honor of Marc Zeplin. On Sunday December 13, 2003, family friend and Florida resident, Rob Grapin raised money on behalf of the Marc S. Zeplin Foundation through his participation in the Annual Weston Rotary Half Marathon in Weston, FL. Rob ran alongside his family members and completed the 13.1 mile race in an impressive 1 hour and 46 minutes. Through sponsorship from friends and associates, Rob raised over $1,000 for the foundation. Special thanks to Rob for his outstanding commitment and support and to all those that supported his effort. The Marc S. Zeplin Foundation visits the Ronald McDonald House for the Holiday Season. The board of directors have made a financial contribution to Ronald McDonald house in an effort to spread holiday cheer. The Ronald McDonald house is dedicated to supporting programs that directly improve the health and well being of children. The contribution will support upcoming holiday events and provide holiday gifts for the children. These photos were from the holiday dinner, the Marc S. Zeplin Foundation hosted at the Ronald McDonald house on December 12, 2003. Santa Claus bears a close resemblence to our own board member, Lenny Zeplin. A memorial tree and plaque have been planted at Oceanside Park. The park was one of Marc's favorite places to spend his time, while growing up in Oceanside. He spent countless days with friends and family on the ball fields and basketball courts. The tree is planted by the children's playground, a favorite place for Marc to take his two children on his visits back to Oceanside. The tree was officially dedicated on September 11, 2003. On August 21, 2003 Rolling Stone Magazine featured Marc's cousin and board member Craig Hassenbein in their feature on Bruce Springsteen. Craig set up a fitting memorial for Marc in the parking lot before the show. Springsteen was a special bond they shared, and it was great that Rolling Stone got the shot.